This week has been busy! School is (once again) starting to take over my life and most of my thoughts. There is so much to do already and I feel overwhelmed; I’m trying to remain calm and not get too anxious. I’ve met some really nice people and have had a nice time sitting with them in class and talking over our work during breaks. I had a job interview yesterday and am hoping to get it. The money is not even close to being good, but it will help me to get experience and I really do need a job! Wednesday morning I was supposed to be doing some reading, but I ended up procrastinating. I drafted a new bag pattern and then actually made it. I finally got up the nerve to cut into the yard of Sketchbook in blue from Anna Maria Horner’s Drawing Room collection; I’ve had it for months, ever since I won the $20.00 giveaway from Quilt Home. While I only had a yard, it’s a bit bigger than a regular yard because it’s home dec. I like using home dec and heavier fabrics for bags, because I think it makes them sturdier without having to use interfacing. It didn’t turn quite as I wanted, but I know what I’d like to change for the next time. 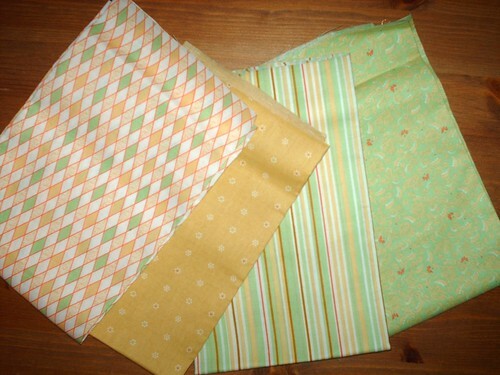 I’d like the corners to be more rounded, and the pleats on the bottom (which you can hardly see) to be bigger. I still like it, and I think it’s unique (especially the fabric). Definitely the fabric makes me happiest! I don’t have any overly exciting stories to share right now, except one about my current sewing machine and how I might be getting a new one (and this time I mean NEW), yay! While I was sewing the above bag I broke two needles; I haven’t broken one (EVER) for as long as I’ve been using a sewing machine. The first one broke and a small piece shot out and hit me in the chest, so I changed the needle (making sure I was using the right one) and played with the tension. Not five minutes later the new needle broke and the entire bottom part (the sharp end) shot out and hit me in the face, cutting my lip open. I changed the needle again and managed to finish the bag, all the while managing not to get any blood from my lip on the fabric. I’ve been having some problems with this machine since I got it a month ago – the stitches are loopy on the backside even though they’re nice on the top (I’ve adjusted the tension and stitch length and nothing changes), the slide plate is raised a bit too much from the machine and it makes it difficult to get things positioned correctly under the needle, the needle doesn’t move (unlike my old machine where it could be centered, or moved all the way to the right or left), it seems to have a problem going through multiple layers of fabric (which makes me worried for quilting), and the last straw was of course the broken needles. The only thing I like about it is the free arm (which is a really great feature). I was telling my Mum all this yesterday (I just had to relate the needle-lip story) and she said that if she can swing it she’ll buy me a new machine for my birthday (which is in about a week and a half). I know she can’t afford a lot and so I’ve been doing research online, reading tons of reviews, trying to find one that will fit my needs at a good price. I’d really like to get the Brother CS6000i, but it’s more than twice as much in Canada as it is in the States. I’m thinking maybe the Brother CE5000, which is a good price and almost all of the reviews have been favourable. I just don’t want a machine that can’t keep up with me. I’ve never had a new sewing machine (or computer for that matter) and I’d like one that I wouldn’t have to replace for at least a few years. In my dreams I’d like a Bernina or Janome, or heck even just my old Singer back! Now back to reading and writing my first paper. I hope everyone has a great weekend! 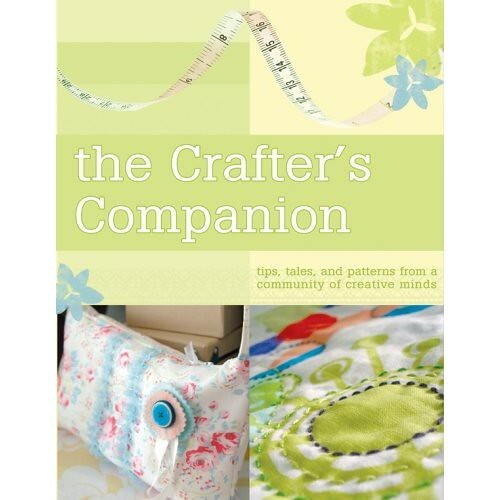 I picked up a copy of The Crafter’s Companion (edited by Anna Torborg) at the public library yesterday and it has really inspired me to write a post about why I craft and why I blog. For those of you who may not have seen or heard of this book, it is a lovely grouping of projects and patterns each by a different designer/crafty blogger (including Amy Karol of Angry Chicken who I have a bit of a girl crush on). 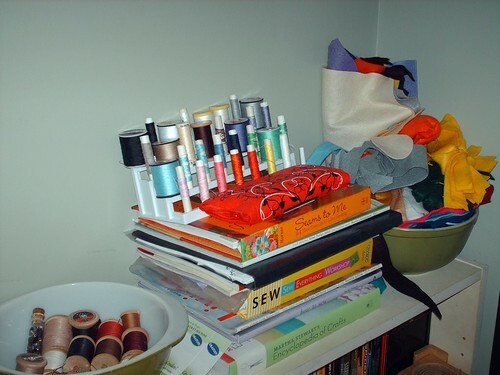 One of the book’s most original and thoughtful aspects is that there is a 4-5 page write-up by each crafter where they explain why they craft, what their inspirations are, and describe their workspace. It’s really very wonderful and I really love how quite a few of the contributors mention that they keep a blog because it enables them to feel part of a crafty community – akin to an online sewing circle. I remember crafting from a young age, I was an only child and so it was left to me to amuse myself (this is also how I developed an obsession with books at such an early age). I would draw, paint, and play with sticks, pompoms, glitter, and glue. Of course you can find the obligatory glittered macaroni glued to a paper plate in my past (or my Mother’s closet), but I was always happiest creating and building things that came from my own imagination. I would build my Barbie dolls three story houses made of stacked cardboard boxes; using wallpaper, carpet, and linoleum scraps to cover the surfaces. I would sew small quilts for my miniature dollhouse using 2 inch fabric samples and de-wadded cotton balls for batting. 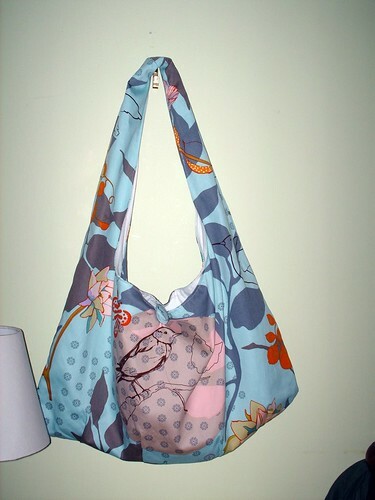 I once made someone stand for 6 hours while I “hand-sewed” a dress to them; and for my first prom I made myself a drawstring purse. My Grandmother taught me how to sew when I was about six; we made little clothes for my dolls and trolls. I watched my Mother embroider and knit, and picked those skills up while watching her. I didn’t sew or really do much of anything that was creative during my Undergraduate because I thought I didn’t have the time for it. Since graduating I’ve begun to pick it all up again and have found that old creative spark has blazed up and now I can’t even imagine not doing it. I wish I had kept up with this passion while an Undergraduate because I really believe it would have helped me during that time. I find inspiration in everything. I love to keep up with crafty blogs to see what others are doing; these wonderful crafters always have the greatest ideas. I look at trends and fashion to try and see where they’re going in the future. I look to the past, especially the quilts and samplers of previous generations; the women who made these timeless articles were incredibly skilled and their use of recycled materials is amazing. Often when I look at a piece of fabric or a special notion, a project or idea starts to unfold in my head – hence I have quite a bit of fabric that is earmarked for a specific project, but hasn’t been touched yet. I don’t have one dedicated workspace in our apartment – unfortunately there just isn’t the space to have everything in one place. 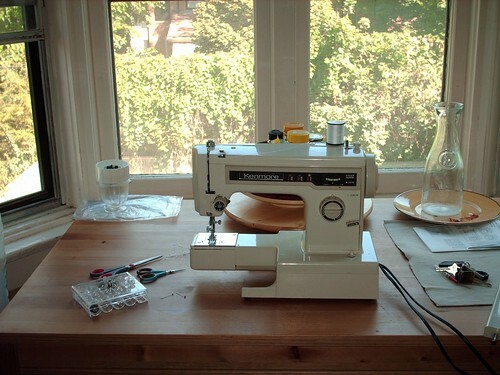 My sewing machine lives in the kitchen, generally on the kitchen table (very rarely in it’s case beside said table). 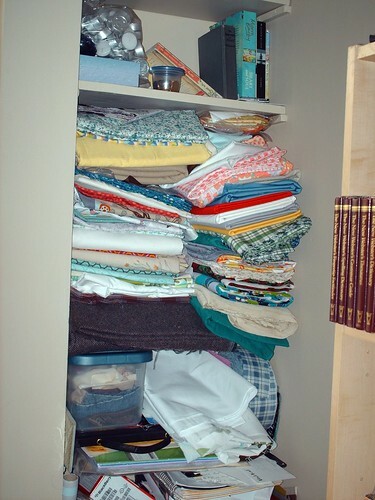 All of my fabric is stacked in some small built-in shelves in the office. Awful looking, isn’t it? 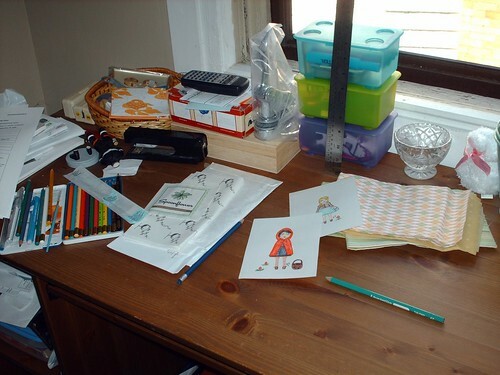 The desk in the office is where I do my watercolours and is generally where I iron too because I’m often too lazy to pull out the ironing board. On top of the DVD shelf in the living room I keep my sewing books, a vintage Pyrex bowl full of felt, another vintage Pyrex bowl full of vintage notions (for display really), and my thread holder. I really love looking at all the colours of thread sitting there. I keep my tools, ribbon, bags of batting, and other notions and supplies in collapsible boxes under the loveseat in the living room. I wish I didn’t have to, but it seems the only way, and I do quite a lot of crafting in the living room because of the large floor space. 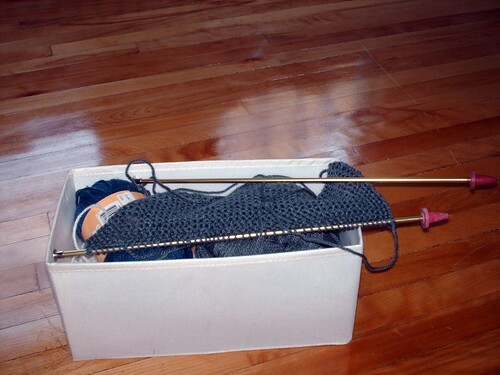 Here’s a little collapsible box of knitting. I hoped you enjoyed that little tour of my workspace(s) and every room in our apartment other than the bathroom and bedroom (are you surprised I don’t keep supplies in those two? ), I really should refold all that fabric - that picture is b.a.d! I originally started blogging because I wanted to record the books that I was reading, and then decided to expand to include my love of crafting. 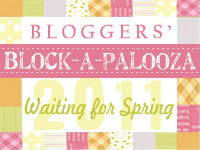 Blogging allows me to share my thoughts, and creativity and to be in contact with other crafty souls. I’m really happy with all of the lovely crafters that I’ve found online, it makes me feel like I’m part of a community and my own world-wide sewing circle. I find comfort in knowing that I’m not “the only one” and inspiration abounds when I read those blogs. I’m lucky to have met a couple of wonderful ladies over the past few days who are in the same MI program as me and who share my love of crafting – Erica, Effie, and Irina – you girls are awesome! Some of the most inspiring (and crafty) ladies I’ve found through blogging are: Dionne, Vanessa, Amy, Anna Maria, Heather, Emily, Kirsten, Ashley, Erin, Cathe, Lolly, Larissa, Camille, Paula, and oh sooooo many more! 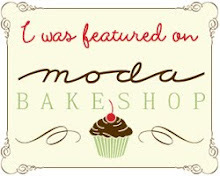 I am writing this post on my new (to me) laptop! I’m super-excited about it and have to say thanks to my best friend Evan who, when deciding to get a new laptop himself, took pity on me and offered me his old one. My PC decided to stop working around December and I couldn’t afford to get a new one. I was a little worried about what I would do when school came, so I’m really grateful to Evan for being such a great friend! I won a giveaway over at Travelling Longhorns a couple of weeks ago and received these beautiful little pieces in the mail last week. Aren’t they lovely? Jennifer made this coffee cozy and tissue holder out of some Japanese fabric she picked up and did a giveaway to (sort of) celebrate her 100th blog post and blogiversary. 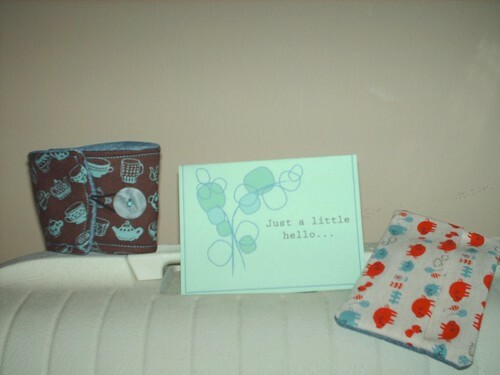 I also think the card she sent along is super-sweet too! 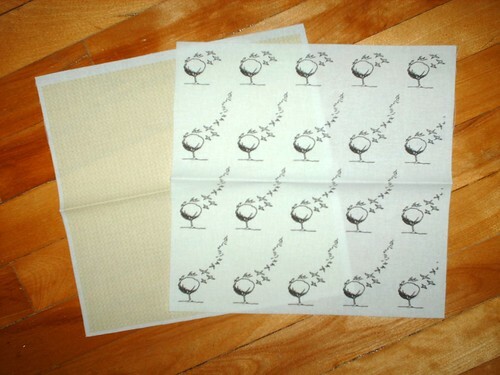 I also received my two free swatches of fabric from Spoonflower that I made for their Free Swatch Day. I had intended to work on some designs when I first heard the day was coming up and then completely forgot about it until I received an email the day of as a reminder. I quickly put these two together so that I could get in on the action. The greenish-yellow one did not turn out the way I wanted; I think I uploaded the design too small and so you can’t really see the pattern at all, but it’s still a nice colour and I’ll use it for something. The other I like much better and is based on an illustration from a 19th century book. I had a slightly jarring, yet also entertaining experience on Friday. I was home alone and heard a noise in the kitchen so I decided to investigate. Upon entering the kitchen I found a squirrel sitting on the kitchen table! The window was open and he had come in through a small hole in the screen; when he saw me he tried to go back out through the hole but I think he was a little scared too and couldn’t get out. I ran to get my phone, keeping an eye on the kitchen as I went, and called Alex because I didn’t know what to do. He suggested that I get a broom and try to shoo him out to which I replied “but I’ll have to go past the squirrel to get the broom!” When I got back to the kitchen the squirrel was gone, and since I knew that he didn’t come out of the kitchen I guessed he’d gone back through the hole. I promptly shut the window. I think he was trying to get into the container of zucchini bread that I had sitting on the table, I’m guessing that was the noise I heard when he knocked it over. While I never want to have a squirrel (or any other woodland creature) in my kitchen again, he was really cute, and it was a fun story to tell that day. I wish I had been able to take a picture. Alex and I headed to Walmart on Saturday to buy a new floor lamp. I wanted to check out the range of Martha Stewart supplies that they carry and so I headed to the craft section. I had no idea that the Walmarts in Canada carried fabric, I was stunned! I knew that some of the ones in the US have fabric centres, but I never thought they’d have some here. Here (at least at the one I went to) they only carry fat quarters and a couple of packages of half yards. I picked up these fat quarters while there. They came bundled together and were pretty cheap. 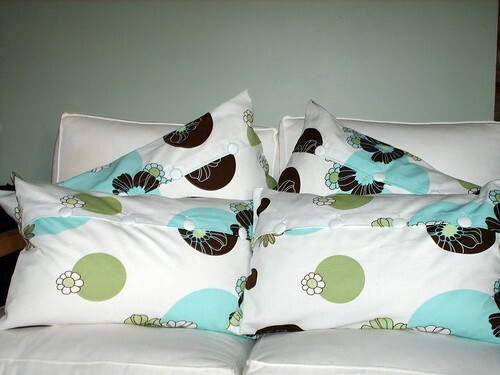 You can’t see it on the orange one (second from the left) in this picture, but it has a faint argyle pattern on it along with the little flowers. I have no idea what I’ll use them for yet, but I thought they might come in handy at some point. Also, the quilt batting at Walmart is cheaper then anywhere I’ve seen before. I can’t show pictures of the project that I finished this week because it’s a birthday gift and I have been told that the recipient does in fact read my blog. I will post pictures after her birthday which is in about two weeks. Today is the first day of school. I am currently sitting in Robarts (the “looks-like-a-peacock” library) on campus; I finished registering and paying some fees about an hour ago and now have an hour to wait until the start of our barbecue. After the barbecue it’s off to a mandatory workshop, then home for a bit, and then back out again for the opening day assembly. I do not feel like a graduate student at all; I keep having this sort of daydream that the faculty is going to get wise to their mistake and unceremoniously throw me out the doors. 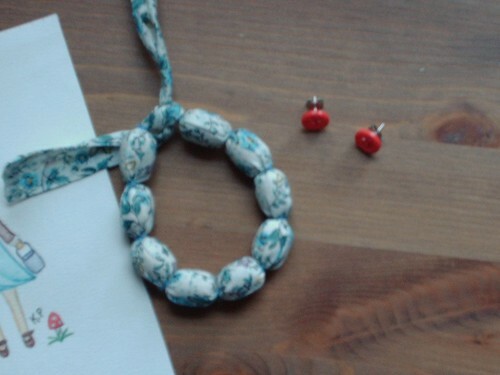 I took some pictures of the bracelet and earrings that I made that I had mentioned in my previous post. I tried to upload them on Friday night using Alex’s computer, but could not get into Blogger. Then I could not get into Gmail and then I couldn’t get to Google at all! I kept either getting an IE “internet connection error” or getting bounced to MSN’s new search engine Bing. I began to think this more than a little odd when I was able to reach all of the Google sites on my Blackberry. Finally I did a little searching around on the internet (obviously not using Google, but rather Yahoo; Ya-boo! is more like it) and found, through some reading, that it appears that Microsoft is trying to force people to use their services (i.e. Hotmail and Bing) rather than Google by not allowing them to reach Google sites at certain points while using IE. Alex decided to try downloading Firefox (which is my preferred browser, although I’d also like to try Google Chrome) after I told him what I thought the problem was, and the problem was solved! Also, the internet is way faster now. There you go, in case you start experiencing some of the same problems. I can’t see how it can possibly be legal (never mind ethical) for IE to basically be blocking websites just because it wants to; seems fishy to me. Sorry about that long story, here’s a picture for you (a bit blurry, but it just can’t be helped sometimes). You can also see a little corner of one of the watercolours I completed last week. Time to go and get some work done. I hope everyone had a great Labour Day and is enjoying the first day back to school; even if you’re not in school or have children who are in school, that first day of the new year is always a little special.